Winner of the European Office Products Awards 2013 for Technology Product of the Year, the Rexel Auto Plus 250X (also known as the Auto+ 250X) is a high volume Auto Feed Office Shredder which will handle stapled documents and shred up to 250 sheets at a time into tiny Security Level S3 - 4x40mm pieces, making it perfect for preventing Corporate and/or Personal Identity Theft. Simply load up to 250 A4 sheets, close the lid and let the machine do the rest! This user friendly unit also has a bypass slot that can shred up to 8 sheets of stapled paper in one pass; making it ideal for busy offices. It can also shred CDs/DVDs as well as credit cards with a separate waste bin to keep paper and media waste separate. Independent tests have shown that you can save up to a staggering 98% of time shredding by using the Rexel Auto Plus 250X vs. a standard shredder. This ultra efficient, automatic feed bulk shredder is designed to make high volume shredding simple with little intervention required. Thanks to the revolutionary Rexel automatic shredding technology, you no longer need to remove staples or paperclips before you shred documents. If you load 250 sheets into the Auto Plus 250X then it will take approximately 12 minutes to complete the process. 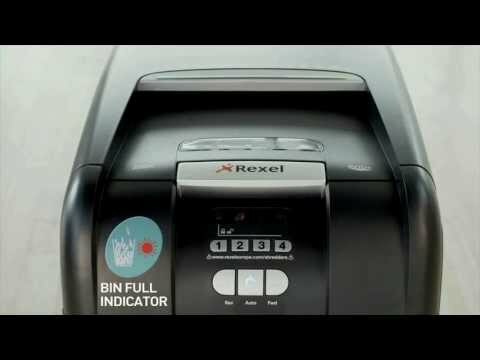 The Rexel Auto Plus 250X features a 4 digit security password function that locks sensitive information into the shredder whilst shredding is taking place to provide additional security. The self cleaning cutters help to prevent paper build up, and the Automatic Oiling System is perfect for achieving higher performance and an extended product life cycle. This high volume machine has a large 40 litre capacity bin that holds over 500 sheets of shredded paper meaning you have to empty it less often. It is also ultra quiet with noise levels less than 60DBA whilst a state of the art LCD panel alerts the user when the machine is ready, the door open, the bin is full, a reverse function, if the machine is overloaded or jammed or if it needs maintenance such as adding more oil. The Auto+ 250X features auto reverse and forward jam features to boost functionality and help clear paper jams and comes with easy to manoeuvre castors to make transportation around your office simple. NB. Due to the unique auto feed technology, the Auto+ 250X only accepts standard A4 copier paper (up to 80gsm). Any paper with a glossy finish or anything thicker such as folded paper or card should be shredded through the manual feed slot. Also note that A5 sheets (or larger sheets such as A3 roughly torn in half) are only accepted through the bypass slot and will not work in the Auto Feed system. The use of a P-4 shredder such as the Auto+ 250X will aid your GDPR compliance.